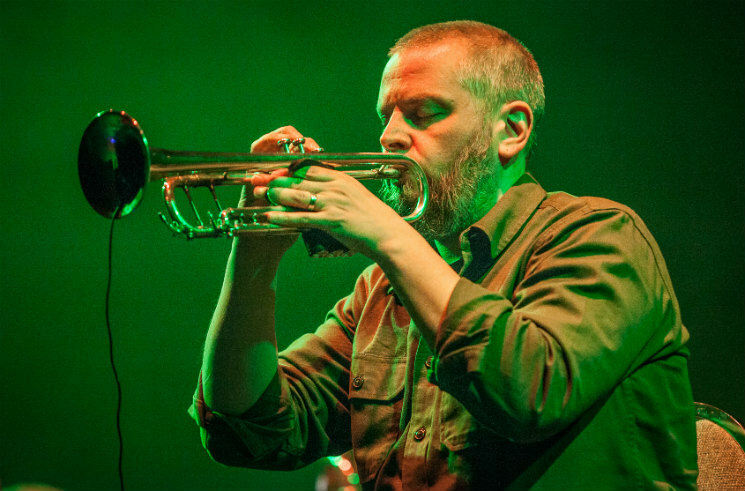 The first two versions of "Seven Storey Mountain" by Brooklyn-based trumpeter, Nate Wooley, (which retains the same basic structure, but gets larger every year,) were trio works. The third and fourth featured a nine-piece band, plus the TILT Brass Octet. The latest version, which Wooley presented last night (May 20), upped the band to 11 pieces, kept TILT on hand and added a narrator. I'm uncertain where the narrator's text originated (perhaps in the Thomas Merton book after which the piece is named? ), but it set a reflective mood into which TILT began playing figures that kept making me think of Mingus's late '50s arrangements. From there, the piece took its traditional path — Wooley's breath attacks led into vibraphone notes, and the instruments slowly piled on from there until there was a fevered blare of improvisational ecstasy tearing through the auditorium. It was just a great massive pile of squall — totally exhilarating. There's a logic to the piece, and a very specific order to when and how each instrument enters and leaves the fray. This particular ensemble — twinned drums and vibraphones, cello, electronics, contrabass clarinet, baritone sax, tuba and trumpet — was large enough to get the job done. But one can't help but wonder how big Wooley's next ensemble to tackle the piece will be. I can't wait to find out.